Daniel Sturridge‘s late equaliser rescued a point for Liverpool after a classic Merseyside derby with Everton at Goodison Park. In the finest meeting between these two sides in years, Everton and Liverpool traded blows almost from the first whistle before both took a point at its conclusion. Philippe Coutinho gave the visitors an early lead but Kevin Mirallas – who should have been sent off for a shocking first-half tackle on Luis Suarez – quickly equalised. Suarez restored Liverpool’s advantage before half-time but Everton, playing with the attacking intent manager Roberto Martinez is determined to introduce, responded in style. Romelu Lukaku, who had twice been thwarted by Liverpool keeper Simon Mignolet, side-footed home the equaliser before his towering header from Mirallas’s corner put the hosts ahead with eight minutes left. Liverpool manager Brendan Rodgers had introduced Sturridge for Lucas with 15 minutes left and the move paid dividends in the 89th minute as he rose to head Steven Gerrard’s free-kick beyond home keeper Tim Howard. The list of chances was almost endless as, even in stoppage time, Howard saved from Suarez, and Mignolet blocked Everton substitute Gerard Deulofeu as both teams went for the winner. They earned a standing ovation at the final whistle and rightly so after a thrilling 90 minutes. Liverpool could only put Sturridge on the bench after he struggled with a thigh injury on England duty – but Suarez was available after flying back from Uruguay aboard owner John W Henry’s private jet following theirWorld Cup qualification on Thursday. And it was inevitable that Suarez would be involved in most of the major talking points of an eventful first half. The Reds were ahead inside five minutes in a manner that would have left Toffees manager Martinez aghast, as his side left Coutinho unmarked at the far post to score from Gerrard’s corner, despite the efforts of James McCarthy on the line. Martinez’s counterpart Rodgers will not have felt any better as Everton equalised three minutes later, Mirallas pouncing to score after Martin Skrtel could not clear a Leighton Baines free-kick. A free-flowing game looked certain to produce further goals. 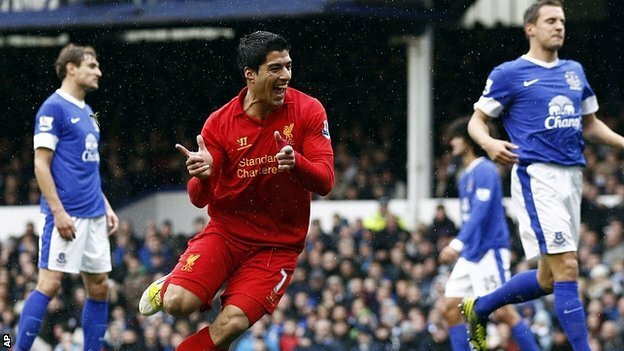 And so it proved as Suarez restored Liverpool’s advantage in the 19th minute. He was fouled by Gareth Barry 25 yards out before inflicting further punishment by curling a low free-kick past the left hand of Howard. Suarez was a central figure once more when he was felled by a shocking high challenge from Mirallas – referee Phil Dowd taking his time to make a decision as Liverpool’s striker received lengthy treatment, before producing only a yellow card. Mirallas, who was injured by a challenge from Suarez in last season’s Merseyside derby, was fortunate to stay on the pitch after what looked a clear red card. The hosts were dealt a blow just after half-time when Baines limped off, but Martinez felt bold enough to introduce gifted youngster Deulofeu, on loan from Barcelona, instead. And he should have scored within moments when he was sent clear by Mirallas, but Mignolet was off his line quickly to block. Lukaku had been a growing threat after a quiet start and twice Mignolet thwarted the giant striker as he looked poised to bring Martinez’s men level. It was Liverpool, however, who had the best opportunity – and contrived to waste it. Suarez somehow ran a slalom through a number of home defenders and the ball fell to Joe Allen, but the midfielder, alone and eight yards out with only Howard to beat, side-footed wide. Everton were throwing everything forward and were rewarded when Mirallas crossed for Lukaku to finally beat Mignolet, who got a hand to his shot from eight yards but could not keep it out. And the striker then soared above Reds defender Jon Flanagan in a mismatch in Liverpool’s penalty box to head in a corner from the influential Mirallas. Liverpool were not to be denied a point though and Sturridge earned it for them. He had the ball in the net again in injury time but was well offside, while the visitors’ substitute Victor Moses also headed wide. But Everton fully deserved something from this game and final whistle blew just after McCarthy had seen a shot blocked in the area.